An "Appeal" is a proceeding taken to rectify an erroneous decision of a court by submitting the question to a higher court, or court of appeal. An Appeal under the Income Tax laws can be filed before the Commissioner (Appeals), the Income Tax Appellate Tribunal, the High Court and the Supreme Court when a tax payer is adversely affected by Orders passed by various Income Tax Authorities. 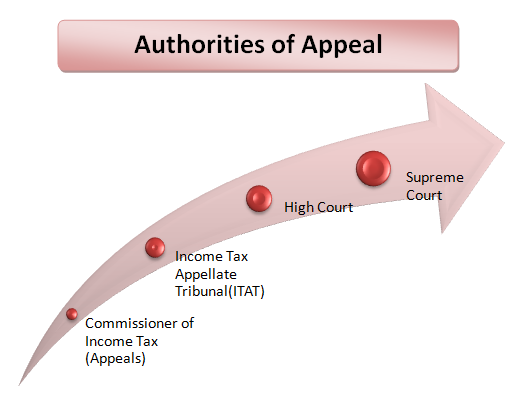 An Appeal before the Commissioner of Income Tax (Appeals) [CIT(A)] is made thrugh a Memorandum of Appeal in Form No. 35. An Appeal before the I.T.A.T has to be be filed in Form No. 36. Further, a Cross Objection is made in Form 36A. The Form of Appeal can be signed by the individual tax payer himself or by a person duly authorized by him holding a valid Power of Attorney. In case of an HUF, it is to be signed by the Karta and in case of a company, by the Managing Director. An Authorised Partner may sign it in the case of a firm. Copy of Order against which the Appeal is preferred. Copy of Form No. 35 filed before the CIT(A) (with complete set of documents). sent by Registered Post addressed to the Office of the Commissioner (Appeals). If sent by post, it shall be deemed to have been presented on the day on which it is received by the Office of the Commissioner (Appeals) or the Tribunal. Appeal to the CIT(A) should be filed within 30 days from the date of Notice of Demand relating to Assessment or Penalty Order, or from the date on which the Order was communicated to the assessee. An Appeal to the Tribunal should be filed within 60 days from the date on which the Order is communicated. The Appeal may be admitted by the CIT(A)/ITAT even after the expiry of 30/60 days, if the Appellate Authority is satisfied that there was sufficient cause for not presenting the Appeal within the specified period. Application for condonation of delay and reasons for delay, along with necessary evidences, should be filed with Form No. 35/36 at the time of filing of appeal. (b) where no return is filed, an amount equal to the amount of advance tax which was payable by him. The CIT (Appeals) is empowered, for any good and sufficient reason, to exempt the assessee from the operation of this provision in case of (b). An Appeal is not maintainable in the case where tax is not deducted at source from payment made to non-resident and is not paid to the Govt. prior to the filing of appeal. One can file an Appeal before the High Court when the case involves a substantial question of law. The Appeal can be filed by the tax payer or by the Chief Commissioner/Commissioner of Income Tax within 120 days of receipt of the Order. If the High Court is satisfied that a substantial question is involved, it would formulate that question. An Appeal filed before the High Court is heard by a bench of not less than two Judges and the decision is by majority. How to Fill Income Tax Appeal Challan? The challan form to be used is Challan No. 280. If the Appeal is for more than one year, Appeal Fees has to be paid for each year through a separate challan. For depositing the Appeal Fees in case of Non Corporate and Corporate Assessee, Major Head 020 or 021 is to be selected. Under ‘Type of Payment’, Minor Head Self Assessment Tax (300) has to be selected. Under ‘Details of Payments’, the amount has to be entered in the "Others" column. Do not use Challan 280 for depositing TDS. WE feel happy if it is useful for any one. Thanks for your appreciation. Sharing of knowledge increases the list of friends. Thanks for appreciation. Appeal fee is paid under Self assessment code and Tax payment for stay application as insisted by Assessing Officer is to be paid under head Tax on regular assessment. sir my assessee is CG department have not pan and want to file appeal against the 234E and want to deposit the Appeal Fees .No i have a question which challan should be use for deposit appeal fees. Please also suggest Which challan shall be used for payment of Appeal Fees, Appeal being filed for TRACES Default for demand of late fees levied u/s 234E? Challan 280 or 281? Hi, We do not have PAN as we are a Government sector (RTO). We are not able to make online payment with TAN. Please clarify. hello.. if i m filing appeal for AY 10-11 then while paying appeal fees which AY should we select?? AY 10-11 or AY 17-18??? If I am going for appeal, I am going to pay 50% of Advance tax for my assessed tax at the time of scrutiny. Pl. suggest Journal entry for above tax paid. I am going to debit P&L or BS, till completion of Appeal. I have CIT order against me and the order date is 10/06/2016 but it was sent on wrong address. Correct address was communicated to CIT office. Even though the order was sent on my wrong address. Now, when I personally went to CIT office on 2nd April 2018 I received the order by hands. So, what date is considered for filing appeal at ITAT? Can I still file it? Please help. What if a deceased receives a demand order for Rs 5 lakhs. Whether the appeal can be filed by legal hier? And do the legal heir need to pay the tax on assessed income before filing the appeal? There is a error showing mismatch of appeal fee payment details with database. Request you to kindly provide your guidance at your earliest.